I recently had the privilege of participating, for the second time in a year, in a leg of what we in the rabbit world call a "Bunderground Railroad," moving rabbits from one part of the country to the next. 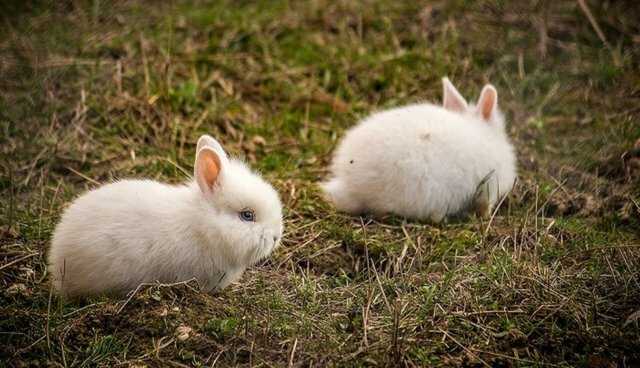 Both times over the past year, the rabbits were moving from Indiana to parts west, as part of two large breeder confiscations totaling 650 rabbits in all. The rabbits, which included Holland lops, mini and full size rexes, and lion heads, were found living in their own waste, many of them terribly sick, and of course none of them spayed or neutered, all had to be moved out of the breeders' garages and into new homes in a very short amount of time or they would be euthanized. Amazingly, thanks to the work of Indiana House Rabbit Society, as well as a huge amount of people, and numerous rabbit rescue groups and other animal rescue groups, not a single rabbit was euthanized. The rabbits were transported in all directions from Indiana, and the ones who moved westward eventually came through New Mexico and stayed with me overnight, along with the two young drivers, Stephen and Trina, who rented a van in San Diego and made two long trips to help these rabbits. Stephen and Trina getting the rabbits cleaned up in my hallway before they left my house for California. On the latest journey, they met another pair of heroic drivers in McKinney, TX who made the journey from Indiana to Texas with 89 of the Indiana rabbits, where a batch of the rabbits were dropped off for WildRescue of Texas, the SPCA of Texas, Bunny Buddies, Citizens for Animal Protection, and the Houston SPCA. Stephen and Trina then took the rest of the rabbits with them on the rest of the journey through New Mexico to California where they would end up with San Diego House Rabbit Society and Too Many Bunnies. Before they left my house, though, two New Mexico HRS volunteers took two of the rexes home with them, and I ended up keeping one of the baby lops, who showed signs of a developing head tilt. After just two weeks of medication, he already seems healthy, and is going to be neutered this week. Not a moment too soon, too, since he's developed a very intense attraction to my cats, and I'm keeping him far apart from all of my other rabbits! 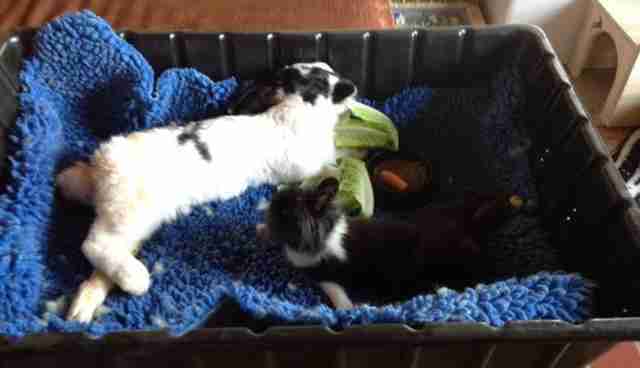 The little black bunny is the disabled bunny who I took from California on the first leg of the transport, she's now called Ermine and is a companion to my own disabled bunny Junior. 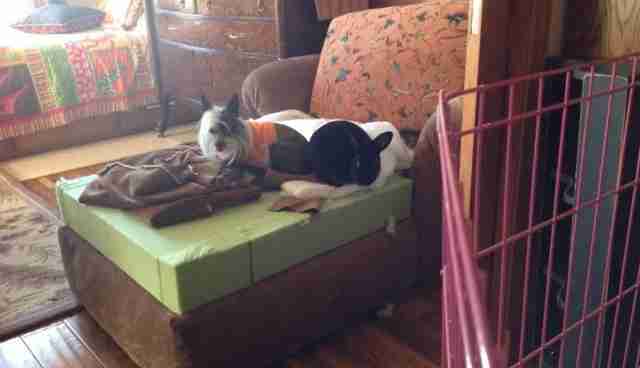 The black rex is Selkie, and she was adopted by Criss Starr, a New Mexico HRS educator. She's hanging out with her new friend Jester in Albuquerque. It takes an incredible amount of energy, money, and people to put together a rescue and transport like this. I know because back in 2009 New Mexico House Rabbit Society rescued and relocated 350 rabbits from the backyard of a man who let his rescued rabbits breed out of control. The effort that goes into solving these crises is enormous. But the effort that could go into preventing them would be minimal -- legislation mandating that companion animals be spayed and neutered is so very simple. And yet the number of communities to pass such legislation can be counted on one hand. And so we continue to work together to clean up the messes.